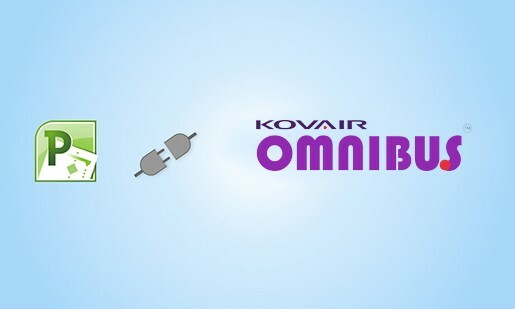 Kovair MS Project Integration Plug-In and Adapter’ enable users to bi-directionally synchronize tasks, planning and scheduling data along with associated available resources from MS Project to the other connected tools in the integrated ALM scenario. Using this MS Project Adapter, both server-based and standalone projects can be integrated. This provides the capability of importing tasks and resources from other integrated tools; perform scheduling, budget estimation, resource leveling in MS Project and then synchronize them back to the other ALM tools. An end-to-end traceability between tasks and subtasks or, tasks and other ALM artifacts can be created and managed in Kovair. The tasks along with their planning data can be synchronized with the other tools that may be used for different purposes including recording of Timesheet against these tasks. These Timesheet data can be rolled up and reflected in the actual Effort Field of the MS Project tasks. The modifications done to the tasks in other connected tools can also be reflected in MS Project. 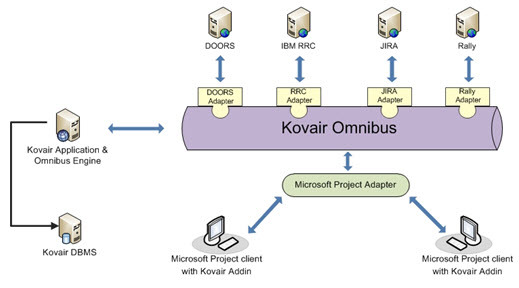 Kovair’s MS Project Adapter works with the following MS Project versions – 2007 and 2010. It supports both Desktop and Server versions of MS Project 2010. Using Kovair’s Reports and Dashboards, users can generate real-time reports from live data consolidated across all the different lifecycle tools. Actionable metrics can also be computed and displayed on the Dashboards based on the users’ role and access privileges. Using the Kovair MS Project Adapter, tasks being managed in MS Project can participate in the overall end-to-end traceability across all tracked artifacts in the scope of the project. Traceability chain can be maintained up to the design elements and code methods, being used in the project. For instance, let us assume a typical Project Management scenario, where the Project Manager creates and manages a project plan in MSP as per the schedule and resource allocation. The team members working in this project use JIRA to view the tasks, update task status and monitor the time spent on each task assigned to them. Kovair integration adapter for MSP takes care of the entire synchronization of the tasks between these two tools – MSP and JIRA. Similarly, in another instance, let us say the Java developers using Eclipse can view/add/edit the tasks assigned to them from Eclipse IDE itself. Microsoft .Net developers can also view/add/edit their tasks from Visual Studio IDE. As they work on their tasks from within their respective IDEs, the updates made by them with respect to the Status and the Actual Time spent in working on these tasks, reflect back in MSP. Bidirectional synchronization of tasks can also be done with JIRA, TFS and other ALM tools that support task management. Kovair Omnibus Reports and Dashboards can be configured to offer better visibility to the management through various graphical and textual reports that can be easily generated from consolidated real data coming in live from all the connected tools. Provides bidirectional synchronization of tasks between MS Project and other integrated ALM tools. Provides efficient collaboration so that all the stakeholders are in sync with the latest changes, thereby facilitating task completion on time. Ability to automatically create tasks within MS Project based on configurable business rules. Ability to import tasks from other integrated ALM tools. Allows project teams to work on tasks from within their preferred tool environment and thereby enhance productivity. Direct import/export of tasks from MS Project. Bidirectional synchronization of MS Project tasks with other ALM tools. Web-based codeless mouse click configuration screens. Support for complex transformation of data.